You’re probably not surprised that UK students get students loans, just like American students. But what you may be surprised at is how their system for paying for college is much more efficient, resulting in lower overall education expenses and less burden for student loan borrowers after graduation. 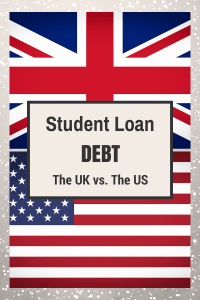 Let’s take a basic look at how students loans compare in the United Kingdom vs. here in the United States, and what the US could learn from our friends across the pond. This is different than in the United States, where all of our loans essentially cover both tuition and living expenses if needed, plus anything else that a student wants to spend the money on. But what makes the UK really interesting is that the UK government caps the maximum amount that students pay for tuition each year. Currently, the cap is set to £9,000 (approximately $15,000). That means, no matter what – whether a student gets a loan or not – the tuition will be a maximum of £9,000 per year. As for that loan? The UK will lend up to £9,000 each year as well, so you can always get a loan to cover your full tuition each year. And even if you don’t get a loan, that’s still the maximum amount you’ll pay in tuition. It makes for much easier planning and budgeting. As for that maintenance loan, there are caps on the amount they lend, with a maximum of £7,751 per school year. That means, if you take on loans for tuition and for living expenses, and go to school for 4 years, the most you’ll ever be in debt is £67,000 (approximately $114,000). And while that may seem like a lot (it is), it is the absolute maximum. That differs from here in the United States, where students can borrow just about any amount they want, and spend it as they wish. Just like in the United States, you must pay back your student loans. However, the UK has an interesting repayment process that makes it easier for borrowers to get started without drowning in student loan debt. First, you only make payments on your student loan if your income is over £21,000 (approximately $36,000) per year. After that amount, your loan payments are capped at 9% of your income per year. One of the interesting features of UK student loan repayment is that it is handled like payroll taxes once you’re employed. Since all of the loans are handled by the government, once you’re working, your repayment amount is taken out of your paycheck with your taxes. So, you never really need to worry about it unless you work abroad. Because, remember, if you’re not employed (so your income is less than £21,000, then you aren’t required to make payments). So, unlike in the United States, where you will have your loans forever if you can’t repay them, the UK system discharges them at 30 years in all circumstances. There are a lot of lessons we should take away from the UK higher education system. First, unlike in the United States, the cost of education hasn’t risen anywhere near as rapidly due to the constraints the government puts on the maximum amount schools can charge for tuition. As a result, costs are lower, and student loan debt is lower. Even in the worst case borrowing scenario, the amount of debt borrowed isn’t insane, and the repayment system helps the borrower maintain a manageable debt load over time. Given the government is the only public lender for education, there is no reason that these can’t be implemented. And I would bet that having these would actually lower the rising cost of education. What are your thoughts on the UK student loan system, and what we could do better here in the United States? I was fascinated by this so I researched it. So interesting how different it is. Tuition fees were only introduced in the UK in 1998 – when I graduated in 1991, tuition was completely ‘free’! There were also no maintenance loans – the local government authority gave us ‘student grants’, which was based on your parents/guardians’ income. I can’t imagine free college education. That’s a great deal. It’s actually only recently that the caps were set at £9,000. I graduated in 2013 when the government caps were set at a maximum of around £3,300 per year, even at the best institutions. So my student loan is less than £20,000, and I graduated from a top 5 university. There was uproar when the Government increased the caps to £9,000 as part of austerity measures, but it’s still a much better deal than in the U.S.. Nobody should be put off a college education because they’re worried the subsequent debt will not make it worthwhile. I just think of student loans as a “graduate tax” and would hardly call it debt in the same sense as, say, a credit card. I graduated just the year before the increase so only came out with £33k debt with interest and that’s after 5 years of Med school. I don’t think I could afford to go med school in the USA!